Note cutoff dates for reduced rates. $69 per night, complimentary breakfast included. Reservation must be made by May 5th to receive this rate. Mention church of Christ when making the reservation. Offering a 10% discount to anyone coming to the meeting. Simply let them know you're with the church of Christ. reservation in by May 5th to receive this rate. 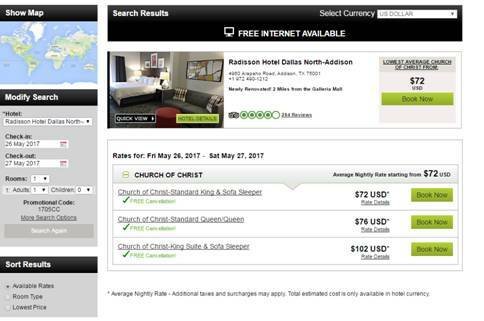 ​at a $74 rate, plus tax for our King or Double room. Cutoff date for these rates is May 17, 2017 to receive this rate. See above picture for rates. This hotel does not offer complimentary breakfasts. They have a restaurant in the hotel, however, but this is not included in the rate. 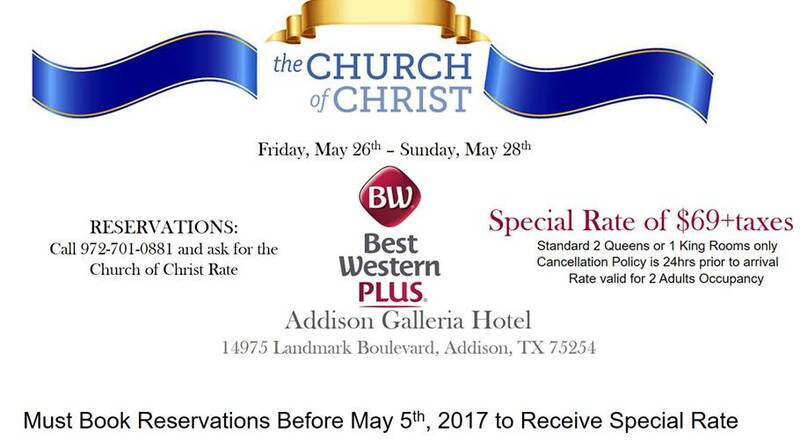 Mention church of Christ when making the reservation to get this rate. Cutoff Date is May 19, 2017 to receive this rate. ​ask for the Church of Christ group block during May 26-28, 2017.